Oftentimes, when patients are bedridden, they can develop damaging pressure ulcers on their skin and body tissue that can be very painful and uncomfortable. These ulcers can be prevented, however, with different types of therapeutic mattresses such as alternating-pressure systems and other pressure-relief mattresses. The key to ensuring these ulcers do not develop is obtaining a mattress that can mold closely to the body in order to redistribute weight. Below you will find some of the best mattresses for pressure reduction. This is an air-alternating mattress pressure system that can easily adapt into a mattress with simple adjusting corner straps. It’s incredibly easy to install and clean, is capable of accommodating up to 250 pounds and is equipped with four large, 2” thick bladders inside the reversible polyurethane foam mattress core. It works by using advanced pump technology that alternately inflates and deflates air cells, which is great for helping to prevent pressure ulcers. It features a variable pressure setting, allowing you to adjust the pressure of the pump to provide maximum effectiveness and pressure relief. The pump cycles every 5 minutes, inflating and deflating the two air chambers, and can be mounted on the bed with a built-in bracket. This is truly one of the best alternating-pressure systems on the market today, and it is the perfect economical and effective way to treat and prevent pressure ulcers! Low-air-loss mattresses function by floating the patient on air-filled cells while circulating air across the skin to reduce moisture and maintain constant skin interface pressure. This is a “True Air Loss” mattress, meaning it utilizes 1000-1300 liters of air per minute to maintain normal skin temperature and moisture levels, yet it will not dry out therapeutic dressings. This easy-to-set-up system offers 10 comfort settings and an auto-firm feature that allows for a one-minute fill rate. The Pulsate Mode reduces air flow every 30 seconds to 50 percent of the comfort setting, intermittently reducing pressure and increasing blood flow. It also possesses Pressure Sensing Technology that equalizes pressure and maximizes comfort by continuously monitoring surface pressure for optimal relief. Like any good lateral rotation mattress, you are able to program the interval to rotate the patient from side to side to cyclically change pressure points. The main advantage of this particular system is the elimination of the caregiver needing to turn or rotate the patient every few hours and the taking away of the use of pillows and wedges to reposition the patient. 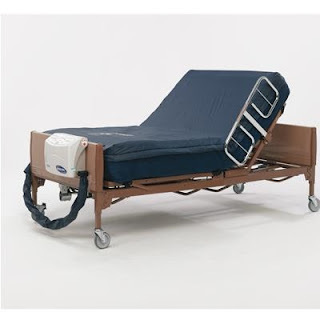 This therapeutic mattress is also perfect for Stage III and IV as well as multiple Stage II pressure ulcers, and has also been shown to be helpful for patients with pulmonary disorders. The MA95Z is equipped with a high-powered 1275 LPM blower to provide true low-air-loss therapy and comes in both a standard 36”X80” size with a 350-pound weight capacity as well as a Bariatric 48”X80” with a 1000-pound weight capacity. This all-in-one mattress provides the benefits of true low air loss, alternating pressure and lateral rotation. This easy-to-understand, caregiver-friendly system is portable, readily attached to most hospital and nursing beds and replaces the mattress on standard medical beds. What truly sets this system apart is that it provides continuous flotation in all turning modes, assuring patients do not “bottom out” on a hard bed surface, easily making this system worthy of being mentioned in the discussion of the best mattress systems for pressure reduction. Obtaining mattress systems designed for pressure relief provides countless benefits, so make sure you check out the selection PHC Online has to offer!